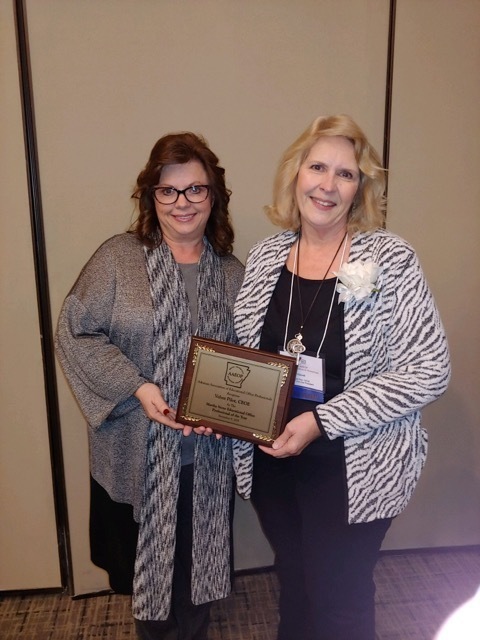 Left: Velvet Pilot receives the Martha Stone Educational Office Professional of the Year award from Glenda Roe, State Chairman of AAEOP Awards. Right: Pilot and Dr. Jeanette Turner pictures together with their awards from last week's annual AAEOP Fall Conference. 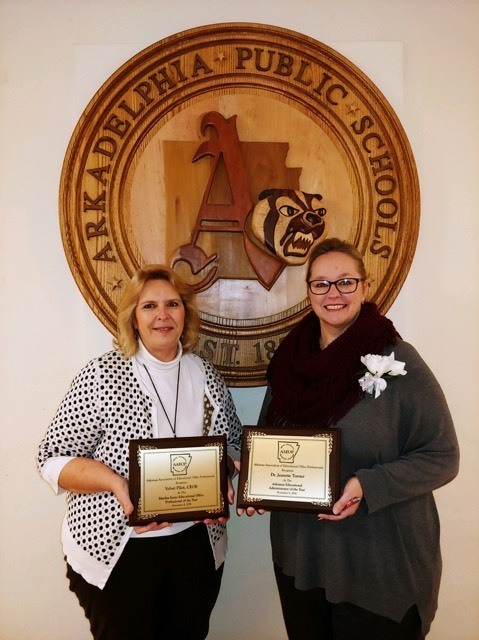 The Arkansas Association of Educational Office Professionals (AAEOP) honored two Arkadelphia Public School District employees at their annual fall conference last week in Fort Smith. Dr. Jeanette Turner, APSD Director of Curriculum and Instruction, was selected as the AAEOP Educational Administrator of the Year and Velvet Pilot, APSD Administrative Assistant to the Director of Curriculum and Instruction, was selected as the AAEOP Martha Stone Educational Office Professional of the Year. Turner has served in her current role in the Arkadelphia district since 2009. Turner taught in the classroom at Peake Elementary in Arkadelphia from 1996-2003 before transitioning to an instructional facilitator at Peake and then an assistant principal in the Bryant School District in 2007. Turner returned to Arkadelphia as District Testing Coordinator in 2008 before moving to her current role in 2009. Pilot served in the private sector for over 20 years before moving to her current role in the district where she has served since 2005. Pilot served as office manager and bookkeeper for a family business in Bryant from 1997-2005 and served as office manager for a Dallas law firm prior to 1997.